I've had sofa angst ever since I had the living room sofa reupholstered two years ago in green velvet with bullion fringe. As soon as it came back from the upholsterer, I started doubting my decision and wondering if I made a big mistake. At the time, I was obsessed with this sofa in the Source Perrier catalog. It is covered in a lovely loden mohair velvet and also fringed. I was told by the upholsterer that bullion fringe is out and nobody does it anymore. But I love bullion fringe! Instead of mohair, I chose a cotton velvet in a majolica green color, thinking I was getting the look that I loved. Then, everyone was slipcovering in linen. You know, the Belgian look. I felt my look was too heavy. So, I lightened up by taking out the rugs and replacing with seagrass. That helped. Eventually, I just stopped caring whether the sofa was too heavy, too outdated, or too Christmas like. After all, we rarely use this room, except at Christmas time! Well, imagine my delight when I got the new Traditional Home in the mail last week, and saw this sofa! I know, it's not quite the same, but it is green velvet and it does have wonderful bullion fringe! I guess my point is to stay true to what you love. There will always be design trends that come and go. So now that the Holidays are approaching, I'm glad I didn't slipcover the sofa in linen! Have you ever had a similar dilemma? Do you stay true to what you love, or are you easily influenced by the latest trends? Being in the blogging world does expose us and influence us more than ever before, don't you think? Speaking of the Blog World, Vignette Design will be one year old on November 8th! Stay tuned for a giveaway--straight from Tuscany! On Friday, I'm joining Cindy at My Romantic Home for Show and Tell Friday, and also Artie at Color Outside the Lines for Vignette Friday. I just discovered a new blog, French Country Cottage, and am joining her Feathered Nest Party! is 'this man" your beloved???? you could feel it in the air!! Love the room, would use it everyday not just holidays. You've probably doubled the hits on the source pierre website today! I know I googled it right away and created a favorites link. 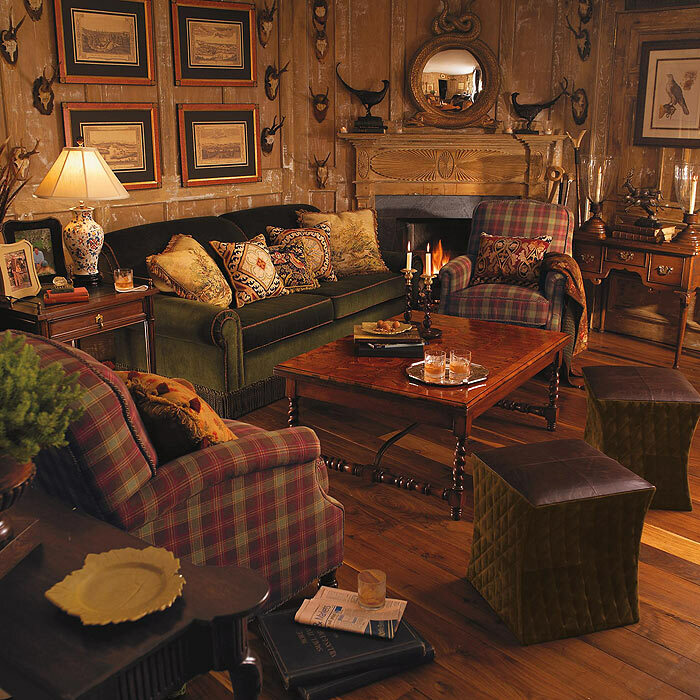 Love those plaid chairs in that old catalog as much as your couch. I am so glad to see your post and know that I am not alone. Personally, I don't care for the Belgian look, but since moving in to my new house, I am conscious of the trend toward linen and burlap and feed sacks and robin's egg blue-like colors and it constantly makes me doubt my decorating choices. Nate Berkus was a guest on Oprah's show once and Oprah asked him what the most enduring style or decorating trend was. He answered that a traditional decor much like the style of Oprah's house (if you have seen it- gorgeous and definitely not Belgian) will never look dated. This summer, I was in Calico Corners choosing some fabric and a young mother was also there choosing fabrics. After she left, the sales lady told me the young woman had chosen everything in a chocolate and robin's egg blue color scheme and she knew that in two years, the young woman would be back because that scheme would be dated soon. She told me that bottle green, reds, and golds in a scheme have held the test of time for as long as she has been selling fabric, which she said was a very long time. So, a long post to tell you I say Bravo! I love your classic look, bouillon fringe and all! Your sofa is beautiful!!! Your entire room is beautiful. I love to see rooms in linen and creams--but that isn't for our home either. That is the nice thing about decorating our homes--we can do what we like to live with and still enjoy the look of other styles in friends, neighbors and blogs! Delores, Classy is ALWAYS in style! Your home is beautiful and it is apparent that you know what you like! Don't ever stray from what you like!!! I love your decorating style. I love warm colors, cozy chairs, color on the walls. I do love looking at the other styles, but I really can't imagine myself living in a cream linen room....I would be coloring it up in no time! Hurray for you for sticking with what you love. There are many thing in my home that I had wanted to change, and in the meantime the style has come around full circle! Your living room is stunning and I like the sisal rug...good choice! I am with Penny on this one! I love the look of all the cremes and linens, but I would be injecting color within 24 hours. Your look reminds me a lot of Alessandra Branca's work. I agree with the commenter who also said that reds, greens and golds never go out of style. And one last thing: I, too, have a love affair with passementerie -- bullion fringe in particular! Delores, I'm so glad you've "made peace" with your green velvet sofa. I was heart sick when you mentioned reupholstering that gorgeous piece in another fabric several posts ago. I actually own TWO green velvet sofas..one which I had upholstered in that color several years ago and one which I inherited from my mother. I'm certainly not a designer, but over the years, I've found that I'm most content in a home that reflects the style and colors I love most...with an occasional updated accessory or two. Thanks Delores and keep inspiring us with YOUR style. I like your sofa and the colors - beautiful room. I have pretty much stuck with the traditional look. I see many styles, and colors out there and think "how pretty", but I would not want to live with them on a day to day basis. Having been back just from Tuscany, you should not have ANY doubts about decorating true to your style! 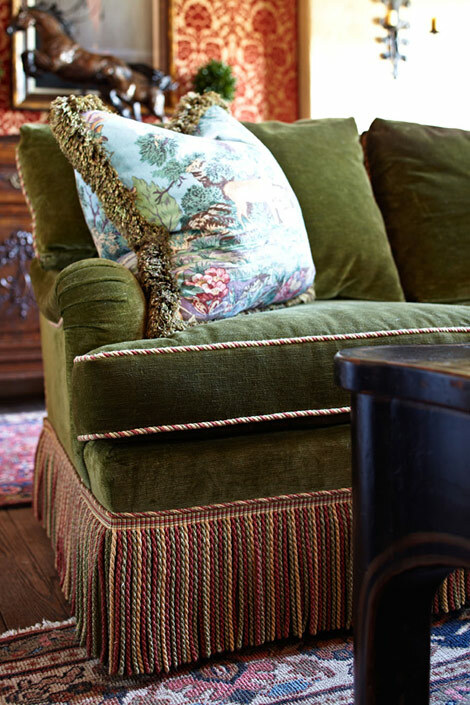 Good taste, wise choices for fabric cover in a time-less style will always look far more 'nest-like' than whatever catalog or trend is dictating us. After all, that dictating is aimed at the 60% that don't have a strong feel for what they are and what they want. So go back to your sofa and sit tall in it and feel good about it. To me it looks far more regal than lots of trashy looks they want to impose upon us. Bella Italia and yes, that's mainly because of it's ancient but forever beautiful buildings, design, paintings and on and on. Have you ever seen Tory Burch's living room sofa? You must, she is one of the most stylish woman on the planet (imo) and she has a green sofa with fringe. I have never had anything green in my life but I want a copy of her sofa before I die. Well said post....I've sure thought about it too. There is so much going on in the world and at our fingertips in a second to see..we don't have to wait for magazines anymore to get the latest trends. I've heard now that wood is coming back because everyone is tiring of white, so you are dead on, do what you love...and I LOVE what you do. I just bought some bullion for pillows (yikes, spendy) but can't wait to see them on my bed, I love running my fingers through them. And your couch is heavenly! Thanks so much for sharing your fabulous style with us! I think we can ALL relate Delores. For what it's worth, since I found your blog, I've considered you to be one of the masters of design here and often refer back to your photos for inspiration for my own home. I'm so over the whole slipcover thing - it's time for a change. Before you know it, that trend will be gone and your gorgeous sofa is timeless. Delores, I love your green sofa and all that wonderful fringe. I love the rich colors and the warmth of you room that the Belgium look just cannot create. You know I love color and will keep it, too. I like the couch very much! My mother just recently visited and declared my traditionally decorated home to be "boring". My MIL on the other hand loves it. I love it too, so I'm sticking with it! Often said, "To thine own self, be true". You were right to stay with what you love. Thank you for reminding us that it's perfectly acceptable NOT to follow all the current trends! Your look is elegantly done and pleasing to the eye. I love it. The whole room fits together just right. I can see how wonderful decorating for the holidays will be for you. Just love your blog and photos! Your room is just lovely and the sofa perfect. I admire your staying true to what you like instead of being influenced by the upholsterer. You're a trendsetter, not behind the times. Love what you enjoy and enjoy what you love. Hi Delores, I have admired your style since I first found your blog. I have always loved the warm colors of Tuscany and your home has that same feel. I try to stay true to my love of traditional style. I may add a trendy piece on occassion. I never spend much for it so if it goes out of style or I get bored with it there is no big loss. I agree with you 100% - you have to stick with what YOU love! I've really enjoyed viewing your blog and find it so refreshing and different from other design blogs that only highlight the latest, greatest, and trendiest things. I too am a lover of all things traditional - antiques, rich fabrics, leather, wood - all things that are supposedly "out" now. I believe that when you stick with the traditional, things that have been around for centuries in English, French and Italian homes, you can't go wrong and that your home will never date. I happened upon a blog recently where someone had painted a BEAUTIFUL antique walnut buffet the dullest gray color all because the dark wood wasn't "in" anymore. I predict in a few years there will be quite a few people who regret their all white, gray and linen homes. It won't be the rage forever. all, we DO live in our homes! Love your couch!!! I've been buying a new couch now for the last 2 years. I am no closer to having a new one because I know what I want and if one more salesman tries to sell me something he has on the showroom floor instead of what I want,, I think i'll just scream!! LOl.. well thanks for sharing. you bring up a very good point. it's what i call serial decorators. i realize that decorators make their money through, well decorating but it seems to have gotten out of hand. is the first photo your home? or a catalog picture for the sofa. i was not sure. whose ever room it is, it is gorgeous. timeless and very ralph lauren to me. classic. i think you are wise to have kept your sofa as is. i think restoration hardware has made a huge mistake in retooling their entire line to belgian. it's all too brown and boring for me. I LOVE YOUR STYLE and home. It is so warm and cozy feeling.....not cookie cutter and with those personal vintage touches that give a home personality. Some homes are lovely but have nothing that makes them distinct! So good for you for going with your gut and what you love! I really weary of people pushing that certain things are "in" or "out".....every home is unique and should reflect the ones who live there or it is only a house, not a home! I LOVE, LOVE, LOVE your sofa! I think it has grand style and destinction! It looks like it belongs to a person that has great taste and has collected beautiful things. It speaks to who you are! Be grateful for your eye for beauty (bullion trim on that sofa is GORGEOUS, REFINED AND UPSCALE!). Linen slipcovers are lovely too, but they say... I haven't developed my style enough to really know.. so I'm just going with the trend! Pretty, but not very interesting. You, my dear, HAVE a style and a decor voice! And it just sings!!!!! Follow your own star! Sometimes I am swayed by the shiny star on the other side of the galaxy...sometimes it fits perfectly...sometimes not! I really love the belgium look and have adopted it in some areas of my home. But, I believe you have two houses and one is more serene in color. So, you're lucky that you can actually have both! The room that your sofa with the fringe is in, seems more formal so the fringe fits in well there. Traditional style is always in style. I LOVE it! It's very elegant with that old world charm that makes it completely timeless. On a similar note thanks for stopping by my blog, I agree the black stove is the way to go! Thanks for your input. I serously adore your home, but I think you already KNOW that, huh??? I love your look! It is individual and says much about you. Why be a cookie cutter? Isn't it funny how we are so influenced by outside sources? We know we love something, I mean really love it, we get it then see a picture or hear someone say something about a different style and the next thing you know we are questioning ourselves. What a shame. I love that you kept it. Yes the "Belgian" look may be "in" but in your home this velvet sofa looks beautiful. I bet it's super comfortable too! I learned a long time ago (I am very olden, you know) that if I stick with classic designs in my big pieces..sofas, chairs, chests..I can "do the in thing" with pillows, decorating objects, even lamps. Then, when that fad is gone, I just sweep up the "in once but now OUT) things, start watching blogs, magazines and the like and start all over. Then, I'm not out a lot of money. Burlap is ok for small things..pillows..but when you have to wash it, it is never very pretty to me. Just not into it, I guess. Now, I DO have #'s on a lot of things right now but...they all will come off very easily. Your sofa doesn't give the "Christmas" vibe to me. It says woodsy, natural and looks cozy. My DH always say to me "what you want doesn't exist yet" - he's usually right. It's frustrating when I know what I want but can't find. Thank goodness the internet has brought the world to my fingertips and I can usually find (at a price I'm willing to pay) - even if it takes awhile! I enjoyed reading about your trip. It's been busy, so I don't usually take the time to comment. Florence and Sienna were two of my favorite places when I traveled for three weeks through Europe several years ago. Thanks for sharing your wonderful photos - they took me back there, if only for a few minutes. I decorate with what I love ~ not worrying about what's "in" or "out", etc. If the style & colors make us happy, that's all that's needed! I love your sofa, I love all kinds of styles and the wonderful thing about interior design is that we can change when we want to! It is gorgeous and you will love it for the holidays. Congrats on the wonderful winning of the Kitchenaid! That's incredible. Your sofa, in my mind, is to die for. Boo hoo on trends -- you are right on to do what you love. I LOVE your traditional decor. It's warm and homey and rich. I have a huge-arm tufted sofa and I love it, even though it's not in right now. I look at the linens like you, and I really think they're beautiful. But at the end of the day, I couldn't live with them, as much as I like to look at them and dream. Your home clearly reflects you and what you love -- be proud of that :) It's what makes a house a home. PS Just found you through Artie and I'm loving your blog. Just proves you have great style & taste!! Are those fringes Vacuum Cleaner proof? YOU REALLY DID WIN! Michael Lee West announced it on Foodie Friday (yesterday), so she said she needs your address!!! Hope that made your day! Hi Delores! *waves* I DITTO what Kathysue said.....I usually do lol! Your sofa with bullion fringe is gorgeous! (as is your whole home) I had to go back a couple of times to see again which picture was the one from Traditional home?... And I have the mag! That sofa is GORGEOUS! In point of fact your entire room is breathtaking. I'm having sofa angst right now myself. I custom ordered two identical sofas, which between the frames and the pillows, I chose seven fabrics, a distressed leather, four trims and nailhead detailing. My angst is that because I chose the fabrics based on viewing 12" x 12" swatches, very small trim samples and the fact that I am not a decorator mean that I am now wondering what it all is going to look like together... and the fact that I ordered TWO doesn't help. My suffering will go on until they come in, which should be at the end of the month. Sorry to go on and on. I guess your post struck a cord with me. Love your blog, by the way. You have exquisite taste.